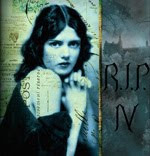 I thought I'd post a double review of the two John Harwood novels I read recently for the RIP IV Challenge. I started with The Ghost Writer (because he wrote that one first, of course!) and then, because I enjoyed it so much, I followed it up with The Seance. I would describe both novels as Gothic mysteries. Harwood uses Gothic elements to bring a nice chilling atmosphere to both books, [SPOILER ALERT] but early on I suspected a human rather than a supernatural cause to the bizarre happenings in his two novels and therefore consider the books more mystery than ghost story. [END SPOILER ALERT] The author didn't appear to try and hide this aspect so I don't consider the knowledge beforehand to be a terrible spoiler, but I realize some would not want to know this. The Ghost Writer begins in Australia with ten year old Gerard Freeman unlocking a secret drawer in his mother's room and discovering a picture of a woman he has never before seen. But why the mystery? Why is her picture locked up in a secret drawer? Who is she? Why is his mother so secretive and controlling? It takes the majority of the book to discover the answers to these questions. Gerard's mother often describes Staplefield, her childhood home in England, to the young boy thereby creating a longing in him to one day travel to this lush land of shady dells and leafy bowers. In his loneliness, thirteen year old Gerard begins a correspondence with an English "penfriend" named Alice Jessel. Alice is a thirteen year old orphan confined to a wheelchair in an institution that, by her description, seems a lot like Gerard's image of Staplefield. Odd, no? Many years of correspondence occur before Gerard decides to travel to England to meet Alice, despite her assertions that she is not yet prepared to see him in person. True ghost stories, the creation of Gerard's great grandmother, are interwoven throughout the Gerard and Alice narrative. They are Victorian tales of the supernatural and are truly spine tingling. I actually enjoyed these stories within the story more than I enjoyed the main account. Gerard discovers the ghost stories one at a time in very curious ways. The stories are even more chilling because they mirror, or precede, events in the main narrative. It is as though the ghost stories begin to bleed into the main storyline and give a sense that Gerard is being led by someone or something that wants him to discover the truth of a horrifying past. I will admit that I had to read the ending of The Ghost Writer more than once in order to "get it." I've heard others say that they too had to read the ending more than once and some have said they never did feel that they understood the ending. This might make the book a good choice for a book club read! Interesting bit: Those familiar with Henry James's Miss Jessel and Dickens's Miss Havisham will recognize Harwood's rather obvious, but fun, nod to those characters through his own spinster characters. After reading and enjoying The Ghost Writer, I was glad that I already had The Seance at hand so I could read it right away. The Seance is set in Victorian England making it even more amenable to Gothic elements than The Ghost Writer. A cursed and ruined mansion with secret passages and hidden rooms, unexplained footsteps, foggy moors and forests, a sarcophagus set into an unused fireplace, a blackened suit of armor looming in the shadows, mysterious and powerful flashes of light and an apparatus for collecting electricity from lightning strikes. What more could a Gothic loving reader wish for? The narrative is nested and delivered through the voices of three separate characters -- Constance Langton, Eleanor Unwin, and John Montague. Constance Langton is the narrator of the story. She is alone in the world when she finds out that she has inherited Wraxford Hall, along with a packet of papers, from a distant relative. She is advised by the family's lawyer to dispose of the cursed mansion ... even if it means that she must burn it to the ground. Wanting to know more about her family, Constance opens the packet of papers where she finds the diary of Eleanor Unwin who, along with her infant daughter and villainous husband, disappeared 25 years ago from Wraxford Hall. It is believed that Eleanor murdered her husband, and possibly her baby daughter, before disappearing. But Eleanor tells a much different story in her secret diary and her account is supported through the words penned by the family lawyer, John Montague, in his own diary included in the packet of papers . Constance believes Eleanor Unwin is both innocent and possibly still alive, and sets out to solve the mystery and scandal surrounding Eleanor and Wraxford Hall. The narratives of both Constance and Eleanor are eventually meshed to provide a thrilling end to the mystery and the reader is left to contemplate the monstrous in human form. Having recently read Ghost Hunters: William James and the Search for Scientific Proof of Life After Death by Deborah Blum, I particularly enjoyed the competing paranormal and Victorian scientific claims of the late 1800s that Harwood includes in The Seance. Throughout the latter 19th century and into the early 20th century, the Society for Psychical Research sought to bridge the gap between faith and science and find scientific proof for the supernatural. Harwood makes excellent use of this tension in telling his own tale. I enjoyed these as well. :) I think the ending of The Ghost Writer could have been handled a bit better, but I LOVED the ghost stories within the narrative. I wish he'd just write a collection of ghost stories!!! After reading your review I can't wait to get my hands on both books! They've been on my radar and my wishlist for a while now as I love most things Victorian and anything ghostly. But I think I may save them for next years RIP Challenge so that I can savour them properly. I hadn't heard of Harwood, but your review makes me want to read these - thanks! Eva: LOL! Yes, Ghost Hunters was fabulous! Now that I've read Ghost Hunters, the people mentioned and the Society for Psychical Research keep popping up in everything I read. Funny how that happens. chasingbawa: If you can wait until next RIP Challenge, these books would be perfect. GeraniumCat: I hope you do! I've heard so much about this book. I need to get it when I'm off my book ban. Thanks for the review!